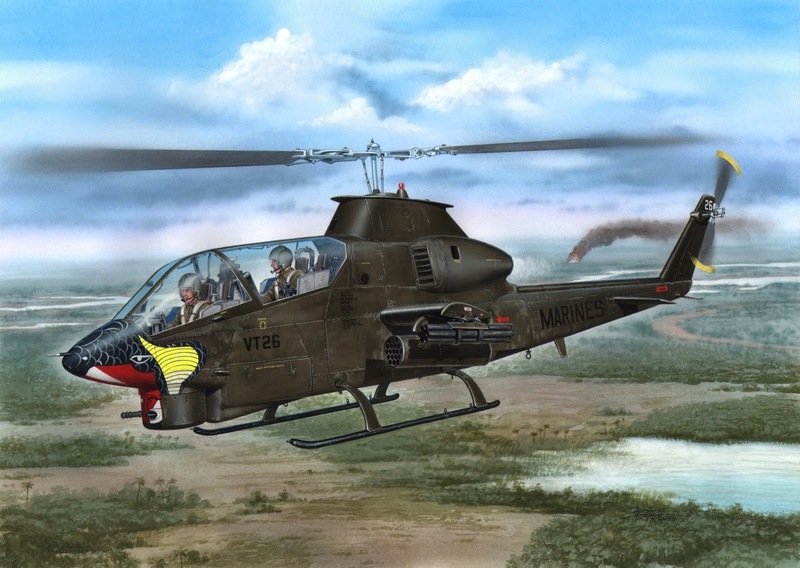 The first two kits of the AH-1G Cobra were released last month. If you are interested in these two kits I would strongly recommend you not to hesitate with ordering them. Soon they will be sold out. 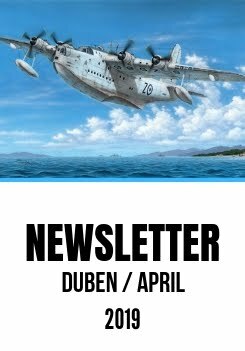 Thus there comes another version of this highly successful helicopter kit. 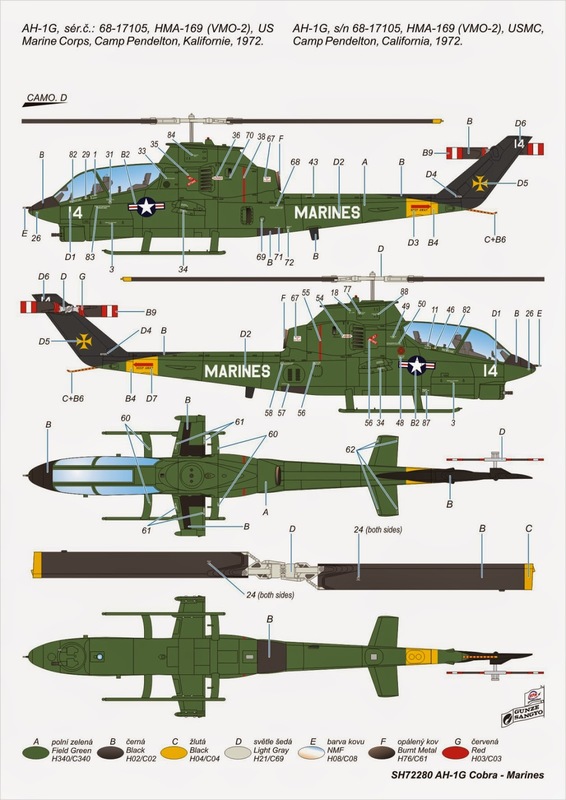 We originally planned to offer only US Marines Cobras in this kit. 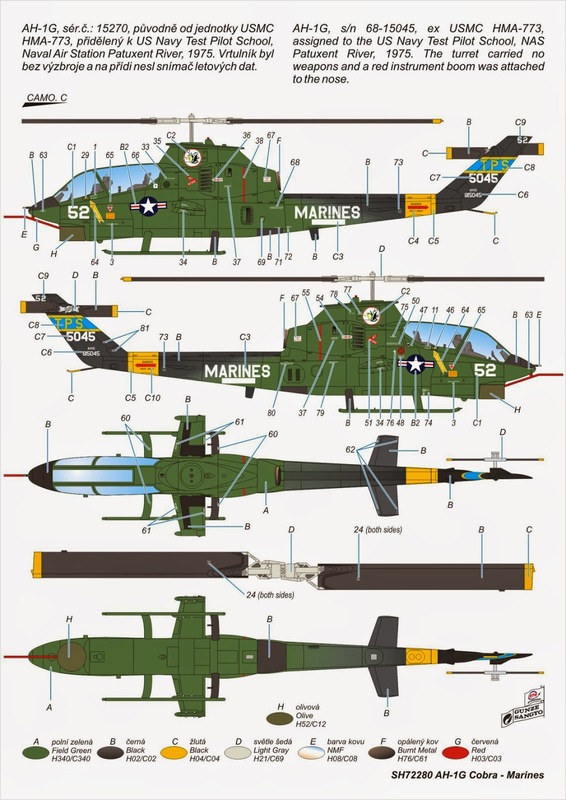 But while preparing this kit we gathered so many attractive machines not only for the US Marines but also for the US Navy that we could not resist and due to the stated attractiveness of these camouflages we included them in kit decals. 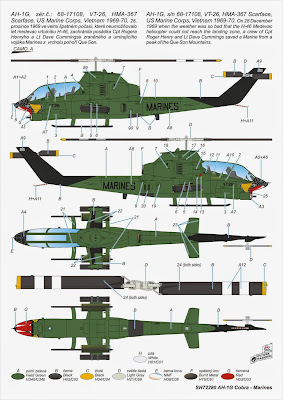 The kit contains five sprues with grey plastic parts that feature finely engraved panel lines, injected clear parts with canopy divided into five parts (thanks to this fact the Cobra can be built with opened or closed canopy) and landing lights; the plastic parts are identical to the SH72274 and SH72278 kits. Moreover, for one of the US Navy machines the kit contains an extra part for the flight data sensor and a resin turret mock up. The instruction sheet is full color in the recent MPM Production standards. The decals included offer markings for 4 machines; two US Marines and two that belonged to the US Navy (one of them was an ex-Marines machine). The US Marines machines feature characteristic Field Green camouflage with black tail rotor boom according to the specifications. The US Navy machine is all black except for the landing skids. 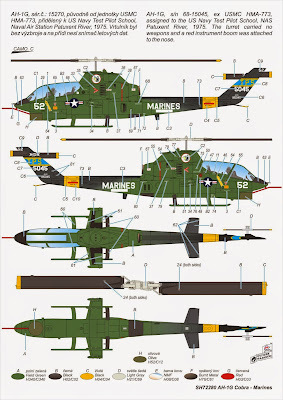 The decals offer not only complete markings but also full set of stencils (completely different from the Army stencils). Camouflage “A” machine served with HMA-367 Scarface unit in Vietnam. Except for the fact it sports a snake head (typical for this unit), interesting history is also connected with this machine. In bad weather that prevented a flight of H-46 medevac helicopter on December 28, 1969 the crew of Cpt Roger Henry and Lt Dave Cummings rescued severely wounded Marine soldier from a peak of the Que Son Mountains. Without their help the soldier would have surely died. The remaining three machines served in the continental USA and unlike the Vietnam based machine all of them feature the late version of the tail rotor.